Successful CSIT Congress in Tortosa. 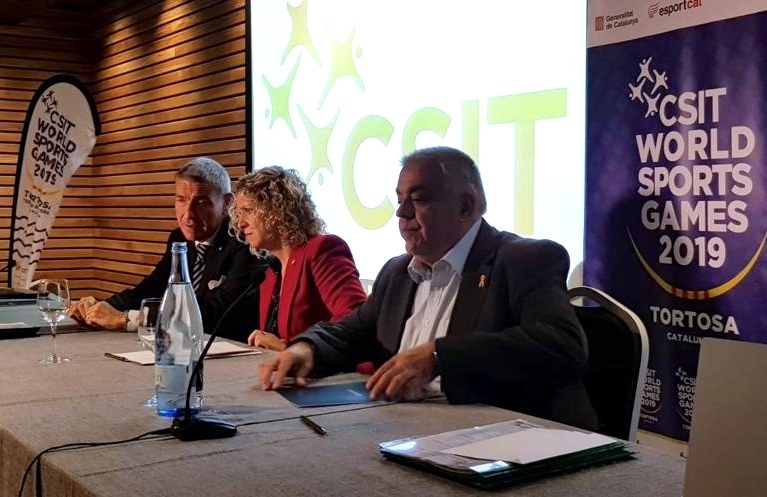 Nine months before the 6th CSIT World Sports Games, July 2-7, 2019 (WSG 2019), in Tortosa / Catalonia, CSIT held its Congress in the WSG host city. CSIT President Bruno Molea was very satisfied with the talks and results of the congress and thanked organizer and CSIT member UCEC for the excellent execution. Above all, UCEC President Jaume Domingo, who organized with his team five wonderful days in Tortosa. On the occasion of the WSG 2019, a number of high-ranking politicians were present with the Catalan General Secretary of Sports Gerard Figueiras, Mayoress Merixtell Roige, Ferran Bel (member of Spain Parliament) and other political decision makers of Terres de l'Ebre. UCEC was admitted to the CSIT as a full member by the Congress, as candidate members confirmed were the Flemish Association "Vlaamse Vechtsport Associatie" (represented by President Ludo Bellemans), the Tunisian Federation "Tunisienne Sport et Travail" (with head of international affairs Sarra Zarrouk) and the Croatian Association "Health Life Academy" (with Secretary General Dario Jagic). Due to inactivity some associations were excluded from the CSIT. The Italian Claudia Borzacchini was elected as the new chairman of the Parasport-Commission and presented her plans about CSIT activities and in particular for the WSG 2019 in Tortosa. In relation to the new field of Parasport, the Congress also agreed an articles changing proposal of the ExCom to open the CSIT to all kinds of sport. Panathlon President Pierre Zabelli was a guest speaker at the Congress, which presented the new Panathlon Award for CSIT members. European Fair Play Movement Vice President Katarina Raczova explained the successful Green Card initiative (since the WSG 2015 in Lignano), which will again be used at the WSG 2019 with its own fair play award. The Court of Arbitration has also been set up to deal with violations of CSIT values ​​and regulations. The court is headed by the Italian lawyer and sports rights specialist Giancarlo Guarino from Rome. Two candidates submitted finally their official application for the CSIT World Sports Games 2021. On the one hand the city of Rome on the initiative of Mayoress Virginia Raggi and on the other hand the capital city of Croatia Zagreb (mayor Milan Bandić) together with the new CSIT member union "Health Life Academy". The award decision will be made at the coming ExCom meeting in March. Prior to this, the working group World Sports Games with CSIT Sports Director Henk Bouchums and Vice President Desislava Yagodin will evaluate the two candidate cities and draw up a report that serves an objective basis for the awarding decision. The CSIT has been working hard for years to come up with innovative ideas and new projects. For the development of Young Leaders and their partners in CSIT and for inclusion of socially disadvantaged groups, the European Union has awarded CSIT funding finally. The projects are already in planning and implementation and other partners in discussion. CSIT's open attitude to new projects and sports is also reflected in the WSG 2019 program, where 15 new associations and activities can be found in the Tortosa Sports Program.